As the days get warmer and spring begins to shift gears into summer, you're probably already planning all the stops for your family or personal vacation. There are literally unlimited options for your vacation, from across the country to across the street but with limited budgets and time frames, you'll want to get the most out of your time and money for your vacation. Well, there's no better stop for people of any budget than the city of Las Vegas, your one stop shop for any kind of entertainment you could ask for. Las Vegas is one of the biggest entertainment capitals of the US, with opportunities to have a blast for any kind of visitor. Take in the sights and visit the historic locations around the city (and the surrounding desert). Nothing is more beautiful than nights in and outside the city of lights. When you're done taking in the natural beauty, stop into one of over 100 casinos and see a fantastic show or music act! And let's not forget about one of the biggest draws Las Vegas has to offer, its gambling! 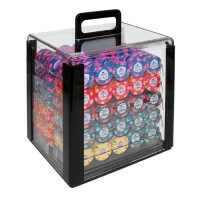 While you're not going to find any poker chips for sale here, you can definitely win them at the slots, table games, raffles, or any number of other fantastic activities Vegas casinos have to offer. In addition to the tables and slot banks, Vegas casinos are known around the world for their five star cuisine in their restaurants and buffets. When you're done swimming in your cache of poker chips, cash them in and treat yourself and your traveling companions to a five star dinner and drink to your victory! The next time you sit down and decide to ponder where you're thinking about heading this summer for vacation, don't take a gamble with other spots. Bet on the sure thing and visit Las Vegas. Recommended destination travel guides. Start planning your trip.